IR Signature Control Low Emissivity Tape™ (Thermal Tape) is a Mid and Far wavelength infrared (thermal) reflective marker that provides a simple covert marking solution for identifying assets on today’s battlefield. IR Signature Control Low Emissivity Tape™ (Thermal Tape) is a Mid and Far wavelength infrared (thermal) reflective marker that provides a simple covert marking solution for identifying assets on today's battlefield. To the naked eye, thermal tape is flat desert brown in color consistent with today's camouflage. However, when viewed with a thermal sensors / viewer, this specially formulated material will reflect a black "cold" signal in open-air environments. 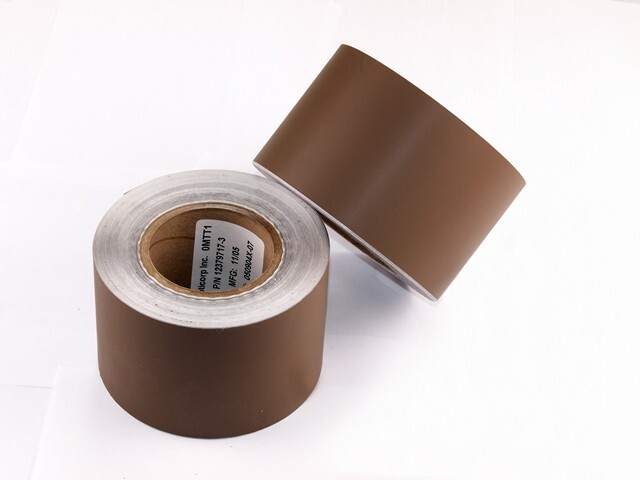 Thermal tape is similar to brown duct tape in appearance, and is available in a 3.75" inch or 48" inch wide rolls, with a pressure sensitive adhesive (peel and stick) backing. Thermal tape is flexible, easily cut with conventional scissors or blades, and can be adhered to variety of surfaces including cloth and metal.